Fish burger is a product unlocked at level 27. Fish burger is made in the BBQ Grill. 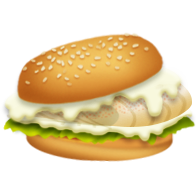 Fish burger can be bought or sold for a maximum price of 226 coins for one fish burger. Buying the ingredients required to make the fish burger costs 187 coins. Although it contains a chili pepper, the fish burger does not appear to have any on the finished product.